Aqua Bath Coatings is a Hartlepool based family business, providing a specialist, high quality, bathroom suite repair & restoration service. Our core services include repairing & restoring roll top baths, slipper baths, cast iron baths, pressed steel baths and sinks. 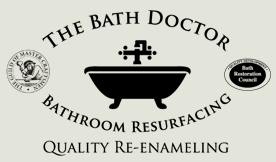 As a Master Craftsman we can professionally re-enamel your bathroom suite, fixing any chip, crack, scratch or whole you may have, efficiently and effectively in place, saving you money on replacing and refitting. Aqua Bath Coatings is owned by professional craftsman, Stephen “The Bath Doctor” Lowe, which he established in 1999. Traditionally Stephen was a time served Coach builder, specialising in the repair and restoration of old sports cars, fire engines, ambulances and trucks. He was approached some years ago to adapt his specialist skills to the restoration of a Victorian Roll Top bath, which he perfectly brought back to life. Following on from this Stephen used his knowledge and years of experience to perfect the preparation techniques across a range of bath materials, including metal, acrylic and enamel. He developed his own unique chemical cleaning process for the inside of Vitros Enamel Baths. Aqua Bath Coatings can professional restore any type of bath in any condition and colour for either individual home owners or commercial clients, such as Hotels & Guesthouses, Home Builders, Interior Designers and Councils.